For your next event you could hire our beautiful Las Vegas Money Wheel to compliment your Vegas themed party or event. Standing 8ft tall behind the relating casino table, the Las Vegas Money Wheel would be a great addition to your fun casino party. With blue baize on the table to match our Blackjack, Roulette and other casino games this particular table will be a stunning addition to your entertainment. Guests will have fun betting their chips on sections of the wheel, it is an easily understood game and guests will very quickly catch on to how to play. If you want the authentic Las Vegas look for your event then this is the game for you. The Las Vegas Money Wheel will bring your guests together to have a fun evening betting their chips. Our Las Vegas Money-wheel will be supplied together with our croupier who will happily explain to your guests the object of the game and how to play. For your next event you could hire our beautiful Las Vegas money wheel to compliment your Vegas themed party or event. Standing 8ft tall behind the relating casino table, the Las Vegas money wheel would be a great addition to your fun casino party. With the same striking blue baize on the table to match our blackjack, roulette and other casino games this particular table will be a stunning addition to your entertainment. It is an easily understood game. Guests will have fun betting their chips on the layout which corresponds to sections of the wheel. Once bets are placed the croupier spins the wheel. Depending on where the wheel lands the players can be paid odds of even money, 3–1, 10–1, 20-1 or the highest pay out of 50-1. The wheel turns and once it slows down the pointer at the top of the money wheel will indicate the winning section. 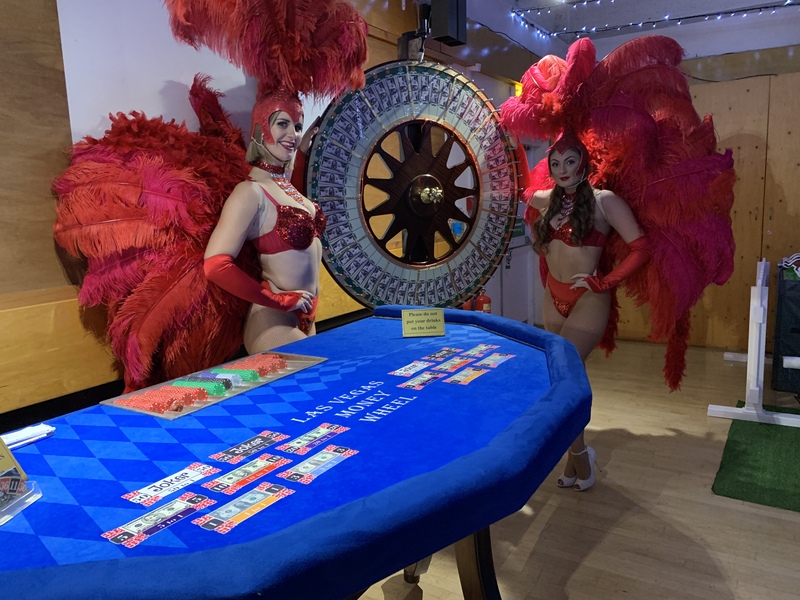 The Las Vegas Money Wheel is a great addition to any fun casino event and a popular option is to hire this together with our fabulous Las Vegas style showgirls. They make a stunning combination to theme an event. Our show girls will meet and greet guests, hand out the fun casino money, pose for photo opportunities with guests and act as lucky charms around the fun casino tables. Our Vegas themed prop hire would also be a recommended option for your fun casino event or Vegas themed party. A popular Vegas package would be our fun casino tables together with the Las Vegas money wheel, two or more showgirls in bikini and feather colour to match your party colours & theme, our giant Vegas themed back drops and our giant glittered golden dice. We will be happy to advise you as to what would be suitable according to your budget, venue space available and guest numbers for your event. Our Las Vegas money wheel has been entertaining guests at all functions including birthday parties, weddings, corporate events, bar & bat mitzvahs and team building events. We can advise on what mix of fun casino tables would be a suitable option for your guests to help ensure everyone has a fabulous time at your next event or party. With our experience we can advise on suitable timings and ensure that all is set up before guest’s entrance for maximum eye catching impact.